I "won" this Keurig Elite from the HSC Charity Auction last fall. Like millions of other Americans, we have become Keurig customers. It's like a revolution in coffee...Keurigs give you a "perfect" cup of coffee with very little work. The American dream, right? We got our first Keurig, a "Mini", just before we moved from Nebraska to Florida in fall 2010. After the movers took our regular coffee pot, it was a nice way to keep having our coffee in the morning. It's small and we didn't have to keep coffee grounds on hand, just a box (or two) of K-Cups and some disposable coffee cups. That one ended up in Dave's office. We like how it turns itself off after the cup of coffee brews. We get a bit paranoid about coffee pots being left on. This past fall we got one for the home. It's been great. 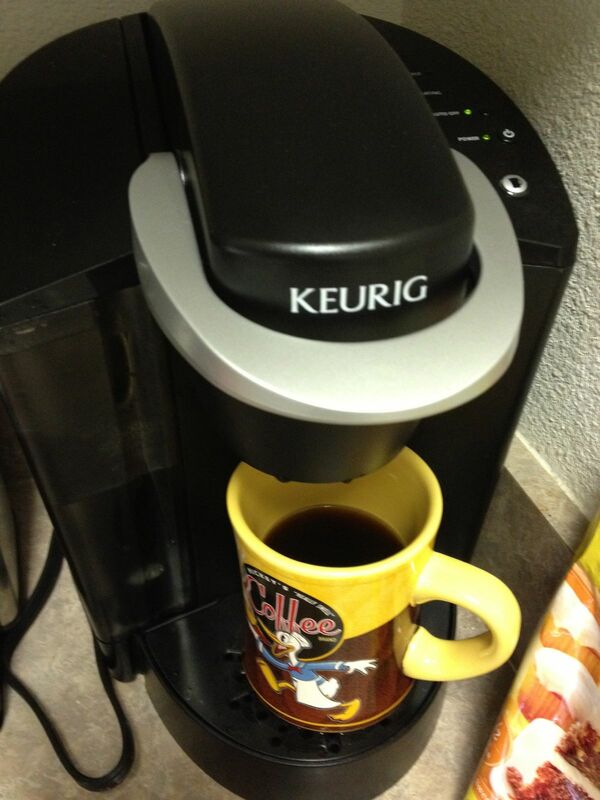 When you register your machine with Keurig, you get coupons for free K-Cups. BOGO for 2 boxes of 48 K-Cups. This was a great deal after Christmas when the Starbucks K-Cups became available online. You can compost coffee grounds -- and as a bonus, they also offset the odors in your compost pail. But with K-Cups, you're dealing with a plastic cup that has a paper filter glued to the inside...all topped with a foil lid. The very ambitious can peel off the foil lid and compost the meager amount of grounds inside. Not only do K-Cups generate a lot of waste, but they're also expensive. Let's talk about the cost. Your typical box of 12 K-Cups will run $6-10. Starbucks will cost more (because they can, people are buying them anyway). The prices vary considerably, based on the brand of coffee and the number of K-Cups in the box. It goes without saying that the large multi-packs will sell for less-per-cup. I often seek out the big deals for the cups: Keurig's own website has good deals, military commissaries have the best non-sale prices around, and you can use the Bed, Bath and Beyond and Kohl's coupons for some good deals also. My goal is to keep the costs under 50 cents per cup. I'm usually pretty good about that, even with the Starbucks cups, which tend to run closer to 80 cents per cup. So I decided to try the "My K-Cup" contraption, which is found where Keurig machines are sold. You remove the K-Cup holder from your machine and replace it with this grey cone, inside which you put a fine mesh filter with 1-2 Tbsp. of coffee grounds. My first attempt at using this was a gi-nor-mous FAIL. My first cup of coffee was super-weak, but when I added more grounds, the system overflowed and I got a countertop covered in hot water and loose coffee grounds. I attempted to adjust the size of the grounds to make the coffee stronger...unfortunately, if the water flows too slowly through the filter, the machine will stop flowing water...and you end up with a smaller-than-planned cup of coffee. I asked friends on Facebook for advice -- and received all sorts of ideas, which I've tried. My Mom clued me into some replacement filter baskets that are bigger than Keurig's. ...what about the millions of us who have already invested in a coffee maker that only uses K-Cups? I'm hoping for some backwards-compatibility here...Amazon has so many options out there to make your Keurig machine more efficient...let's see what we have, shall we? I also tried a friend's idea to simply stuff a standard paper filter into the "My K-Cup" grey cone. It was on its way to brewing a nice strong cup of coffee but then the water began to overflow around the filter. Oops...another mess on my hands. How about a standard paper filter in My K-Cup? That didn't work so well either. What am I doing? I'm back to the standard, expensive, wasteful K-Cups. For now. I've been trying to get my coffee right for two weeks with the more resource-friendly options and so far haven't been successful. On weekends we revert to our classic French press coffee maker, no filters, and the grounds go straight into my compost pail! Yeah, I've been debating about this, but have stuck to the French press. We have an electric hot-water dipsenser, and I add a bit of Frapuccino to flavor the coffee.